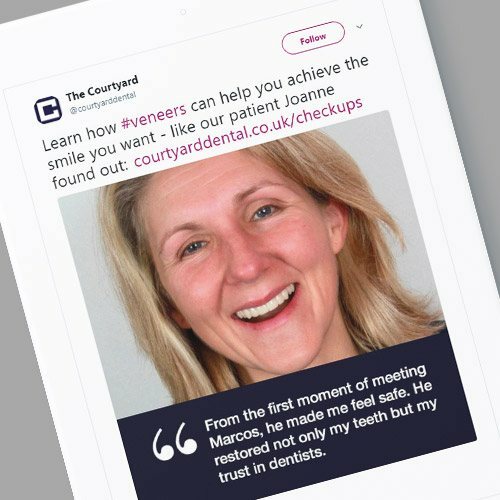 Our work with West Yorkshire’s leading private dental practice has seen a 300% increase in social media referrals, with a 20% sales increase from this activity in one year. The Courtyard is an award-winning private dental practice that also treats NHS referrals. They’re based in Huddersfield, just like us. Their modern practice specialises in cosmetic dentistry such as veneers and implants, as well as providing regular check-ups, using up-to-date technology and techniques to achieve those whiter smiles. The Courtyard has a great reputation locally, and has traditionally grown its patient lists through good old word of mouth. However, they’ve recently begun to set their sights a little bit further afield, looking to appeal to customers outside of Huddersfield, and even outside of Yorkshire. We were originally approached in late 2016 to manage Google AdWords for the practice, running targeted ads at potential patients that they would otherwise be unable to reach. 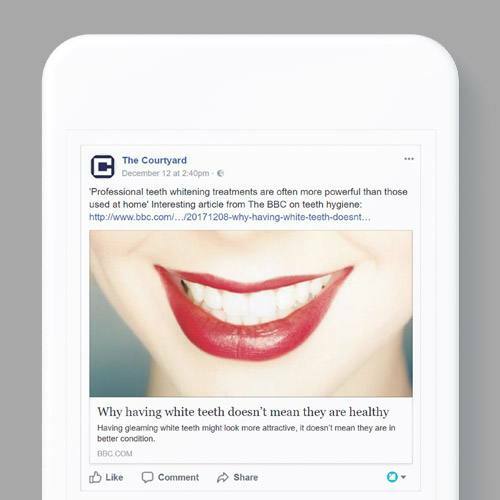 We run strategic AdWords campaigns for The Courtyard, targeting cities outside of Huddersfield, and focusing on cosmetic dentistry treatments such as veneers as we knew these were the practice’s best-sellers, with a small campaign on the cosmetic procedures they also provide. This approach immediately saw improvements in their enquiry figures, growing by 45%. Because of this success, we were invited to provide a wider range of digital marketing services. We now run The Courtyard’s social media across Twitter, Instagram and Facebook, growing follower counts and improving visits from social media by 300%. We also create a quarterly email newsletter for their network of NHS referral practices, with updates on treatment and training opportunities. We’ve developed the website’s content strategy, focusing on lead generation and SEO, as well as writing the practice’s blog, Word of Mouth, incorporating search keywords and different stages of their potential patients’ buyer’s journey. We’ve also greatly expanded on-site content in line with SEO best practice, creating a dedicated section of the site tailored towards NHS referral practices. The Courtyard are continuing to expand – they recently acquired their fourth location here in Huddersfield, and we’ve been supporting them with PR around this, as well as continuing with monthly activity and reporting. The Courtyard are fantastic to work with – they’re truly passionate about what they do, and we’re excited to continue playing a part in their growth.